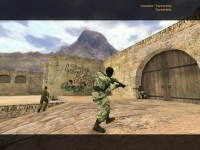 Counter Strike 1.6 is one of the most popular shooters of all time and despite many people still playing it as a standalone game, it first began as a mod for Half Life, which was released back in 2000. Since then, Counter Strike 1.6 has continually evolved and became one of the best first person shooters in the history of the genre. The main premise of the game is that two different teams will face each other in predetermined maps with certain goals. You can choose to play either as a terrorist or counter terrorist, and each team has its own agenda. While the first one needs to place the bomb and secure it until detonation, the latter has to ensure that the terrorists are stopped at all costs. In the beginning of the game each team member can customize the arsenal and as he plays he will get an in-game currency that can be used to earn even more levels. What's very interesting about Counter Strike 1.6 is that alongside the normal bomb maps it also includes hostage and VIP maps which do add a lot of value to the overall gameplay. The game can be played on your own, against bots, or you can engage in multiplayer battles with people from all over the web. Singleplayer games can be fun and suitable for a target practice session, but the major challenge is definitely the multiplayer, as here is where the game shines. Thanks to the multiple game modes, the large amount of modifications made by the community as well as the millions of people that still play it even today, Counter Strike 1.6 is a great game that you can play whenever you want. It will help you improve your skill in FPS games and through it you will even be able to strategize better in other titles. The overall gameplay in Counter Strike 1.6 is action packed, as you will always be on the run to complete objective. Not only that, but the game runs amazingly well on older device which makes it a great solution for those that have an older computer but still want to play great games on it. The player community in Counter Strike 1.6 is friendly and established, so no matter when you choose to enter the world of CS, you can rest assured that the others will welcome you with open arms. The numerous maps in the game, including those created by the community will offer you hundreds of hours of gameplay. Counter Strike 1.6 might not be a new game by any stretch of the imagination, but it works really well on any computer nowadays and it brings a very interesting gameplay that simply makes the whole experience worth it. With a massive community, tons of maps and one of the most alert gameplay sessions that you can find in a game, Counter Strike 1.6 that continues to be one of the best FPS experiences that you can find right now on the market. W, A, S, D = move. B = show the buy menu to buy weapons. ... ect. You can see them in Options > Keyboard menu. For better graphics, access the Options > Video menu and then set the resolution to 800x600 or above. If this makes problems, just return to the first setting. Play offline or online in this nice FPS game. Be a part of commando squads to infiltrate deeply into enemy terriroty. Have fun playing first person shooter game even with a low-end computer.